In 1955, the first kaiju (怪獣 kaijū, lit. “strange creature”) battle took place in Godzilla Raids Again (a.k.a. Gigantis the Fire Monster and Gojira no gyakushu “Godzilla’s Counterattack”) between Godzilla and Angilas (Anguirus). To capitalize on the success of Godzilla (1954), this sequel was rushed out to the theaters on April 24, 1955. The main battle between Godzilla and Angilas took place in the city of Osaka that concluded with a fatal bite to Angilas’s throat atop the ruins of the just-destroyed Osaka Castle. Angilas is finished off by Godzilla’s radioactive breath after falling into the Okawa River. The Toho miniature craftsmen faithfully recreated the Castle in miniature. 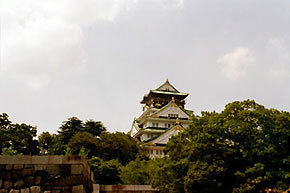 Although that miniature was destroyed during the battle, the real Osaka Castle still stands today as a tourist attraction. On the 8th floor observation level of the Castle, one can get excellent panoramic views of the the city of Osaka, including Osaka Business Park which includes the Twin 21 towers attacked by Godzilla in Godzilla vs. Biollante. Construction on Osaka Castle (大阪城 Ōsakajō) started in 1583 on the former site of the Ishiyama Honganji Temple, which had been destroyed by Oda Nobunaga thirteen years previously. Toyotomi Hideyoshi intended the castle to become the center of a new, unified Japan under Toyotomi rule. However, several years after Hideyoshi’s death in 1615, Tokugawa troops attacked and destroyed the castle and terminated the Toyotomi lineage. 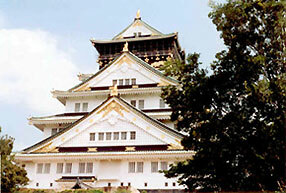 Osaka Castle was then rebuilt by Tokugawa Hidetada in the 1620s. However, the main tower was fated to be struck by lightning and burnt down in 1665. 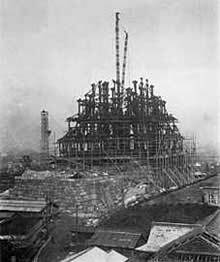 In 1931, the present ferro-concrete reconstruction of the castle was built. Bombing raids in 1945 caused extensive damage to the Castle. The Castle was given an extensive renovation in 1995-1997, giving it new lustre. The Castle now houses a museum that documents Toyotomi Hideyoshi’s life and the history of the castle. It contains many interactive exhibits for visitors. On the Castle grounds is a time capsule from Expo ’70. Armand Vaquer, A.A., B.A., ECV, is a contributing writer and photographer for the Monster Island News and Godzilla 3D blogs. He is also a contributor to JapanTravel and is author of The Monster Movie Fan’s Guide To Japan.